Co-author: John Azubuike (@jnazubuike), KEC Ventures. Note: This article does not necessarily reflect the opinion of KEC Ventures, or of other members of the KEC Ventures team. Supplying the world with nearly everything is an enormous and complex job: there are things to discuss. – Rose George (2013-08-13). Ninety Percent of Everything: Inside Shipping, the Invisible Industry That Puts Clothes on Your Back, Gas in Your Car, and Food on Your Plate (p. 142). Henry Holt and Co.. Kindle Edition. Although it is largely hidden from the day-to-day experience of most people, maritime shipping is central to the modern system of international trade and the way our world operates. According to the International Chamber of Shipping, the international maritime shipping industry transports about 90% of all physical goods traded internationally. To give that some further definition, the World Trade Organization estimates that, in 2014, its members collectively exported merchandise worth $18 trillion. The U.S. Census Bureau estimates that in 2015 seaborne trade in the United States amounted to $1.56 trillion, with imports accounting for about 67 percent of that total. Despite its size and importance, the ocean freight shipping industry has remained largely untouched by the kind of transformation that software technology has imposed on other markets. That is beginning to change as a number of startups attempt to build products to serve that market. This post represents our attempt to understand the landscape within which such startups operate. A company is what a startup becomes once it has successfully navigated the discovery phase of its lifecycle. This is the phase during which relatively fixed organizational structures start being built in order to facilitate the firm’s work on behalf of its customers, employees, shareholders, business partners, and society. KEC Ventures invests in early stage startups. Therefore our primary purpose in studying the ocean freight shipping market is to gain adequate context for the instances when we might assess pre-Series A startups trying to solve problems in this market. We have not yet made an investment in any of the startups in this market. Discuss some threats such startups might encounter. Lastly, we should point out that how we think about the market may not line up precisely with how industry insiders think about it. However, our purpose is to understand the landscape in sufficient detail to become intelligent investors in startups that have set out to solve problems for this market. What is Ocean Freight Shipping? Ocean freight shipping comprises the complex set of activities involved in transporting goods of all kinds from producers in one country to consumers in another country, where the two countries are separated by an ocean or a sea. We have previously discussed freight trucking, and so in this post, we will focus on the maritime-only portion of the activities that surround ocean freight shipping. In the discussion that follows note that there is a blurring of the lines, somewhat, between the categories . . . Sometimes one category can morph into another, and vice versa . . . For example, a containership might be used to transport a comparatively small amount of bulk cargo. Container Ships: Most merchandise that is transported by ocean freight travels by container ship. Container ships carry their cargo in reusable, standardized 20- or 40-foot long containers that are designed to be easily transferred from the ship to a truck or train without the need to access the cargo directly. The freight capacity of a cargo ship is described in twenty-foot equivalent units (TEUs). Container ships transport general cargo, or cargo which is poorly suited for bulk cargo shipping operations but which is well suited for containerization. Most general cargo is now transported by containerships. Bulk Carriers: Bulk carriers transport merchandise that cannot be containerized – mainly raw materials like timber, coal, cement, grain, iron ore, etc. Bulk carriers are equipped with special machinery to aid in the handling of this type of merchandise. Bulk cargo comes in the form of dry bulk or liquid bulk. Liquid bulk is transported using tankers. Often, bulk cargo is transported in full shiploads. There are 6,085 ships currently in service in the world tanker fleet with an average DWT of 86,211. There are another 945 tankers on order with an average DWT of 106,408. The chart below shows the amount of crude oil that is transported by the world’s tankers. Specialist Ships: These are ocean-faring vessels designed to function in support of other types of maritime vessels or to perform activities related to specific industries. For example, an ocean-going vessel that’s been equipped to transport entire shiploads of motor cars from Asia to North America would fit this category – ships designed to carry cars are described as roll-on/roll-off (RoRo) ships. Decades later, when enormous trailer trucks rule the highways and trains hauling nothing but stacks of boxes rumble through the night, it is hard to fathom just how much the container has changed the world. – Levinson, Marc (2016-04-05). The Box: How the Shipping Container Made the World Smaller and the World Economy Bigger (p. 1). Princeton University Press. Kindle Edition. Taken together, bulk carriers, tankers, and some specialized ships comprise the tramp shipping segment of the market. The tramp trade describes cargo moved by ships that do not have fixed schedules or make planned port calls. These ships are usually engaged on a contract basis for the transport of commodities, namely crude oils, product (or refined) oils, major dry bulks (those comprising greater than two-thirds of the world dry bulk trade such as iron ore, coal, and grains) and minor dry bulk (those comprising the remainder of the bulk trade such as steel products, forest products, cements, and non-grain agricultural products like sugar). demise charters, under which the ship is contracted but the shipper is responsible for staffing. The diagram below is a self explanatory depiction of the organization of the shipping market. It is taken from the 3rd edition of Martin Stopford’s Maritime Economics. Source: Stopford, Martin. Maritime Economics, 3rd Edition. How is The Ocean Freight Shipping Industry Structured? Shippers: Any entity that pays to have its cargo shipped. Non-Vessel Operating Common Carriers (NVOCCs): An NVOCC is similar to a freight forwarder. However, an NVOCC may go an extra step and physically handle cargo on behalf of shippers in the sense that they will load cargo onto containers that then get shipped by ocean carriers. NVOCC’s generally will accept partial container loads for shipping on the shipper’s behalf. An NVOCC may own or lease its own containers, but does not own any ships. 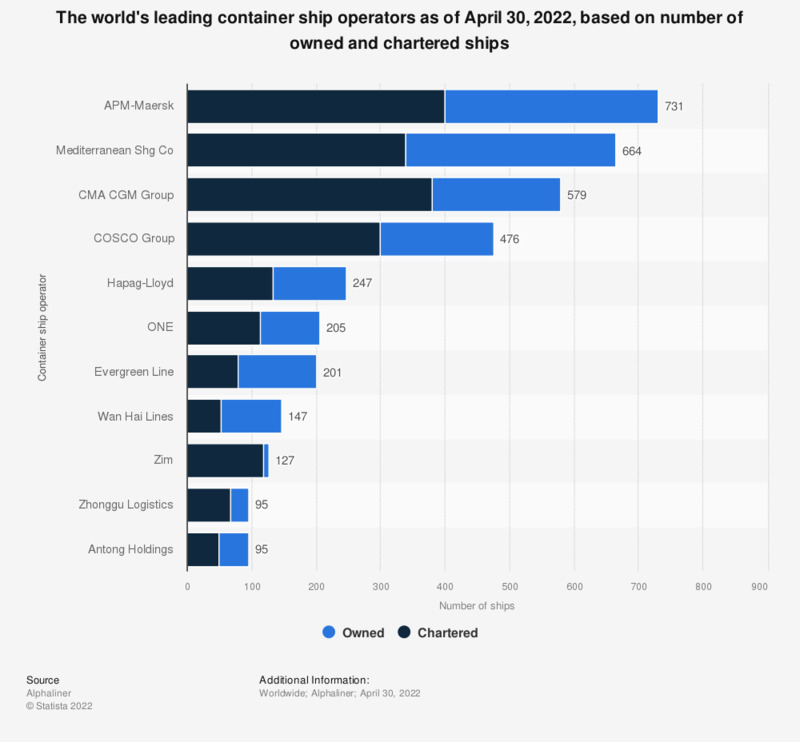 The following chart outlines the world’s leading container ship operators. Other participants in the wider maritime freight market include customs authorities, warehouse operators, freight trucking companies, and various entities that are the end customers of the shippers. For example, Best Buy might be the end-customer for shipments of Apple’s iPhones from Foxconn’s manufacturing facilities in China. As we have stated previously, liner shipping describes the portion of the maritime shipping market that adheres to fixed schedules on regular routes. Charter shipping occurs on a just-in-time basis, usually brokered through the services of a freight-forwarder or an NVOCC on behalf of the shipper. The term “tramping” is used within the industry to refer to charter service. One anecdote we heard suggests there may be at least as many as a dozen intermediaries involved in the process of getting one shipment of goods from one point to another. However, it is not clear if this is broadly true across the industry or of it applies only to certain segments of the market. What Are The Economics of The Ocean Freight Shipping Industry? “In general terms, the demand and the supply of maritime transport services interact with each other to determine freight rates. While there are countless factors affecting supply and demand, the exposure of freights rates to market forces is inevitable. Cargo volumes and demand for maritime transport services are usually the first to be hit by political, environmental and economic turmoil. Factors such as a slowdown in international trade, sanctions, natural disasters and weather events, regulatory measures and changes in fuel prices have an impact on the world economy and global demand for seaborne transport. These changes may occur quickly and have an immediate impact on demand for maritime transport services. As to the supply of maritime transport services, there is generally a tendency of overcapacity in the market, given that there are no inherent restrictions on the number of vessels that can be built and that it takes a long time from the moment a vessel order is placed to the time it is delivered, and is ready to be put in service. 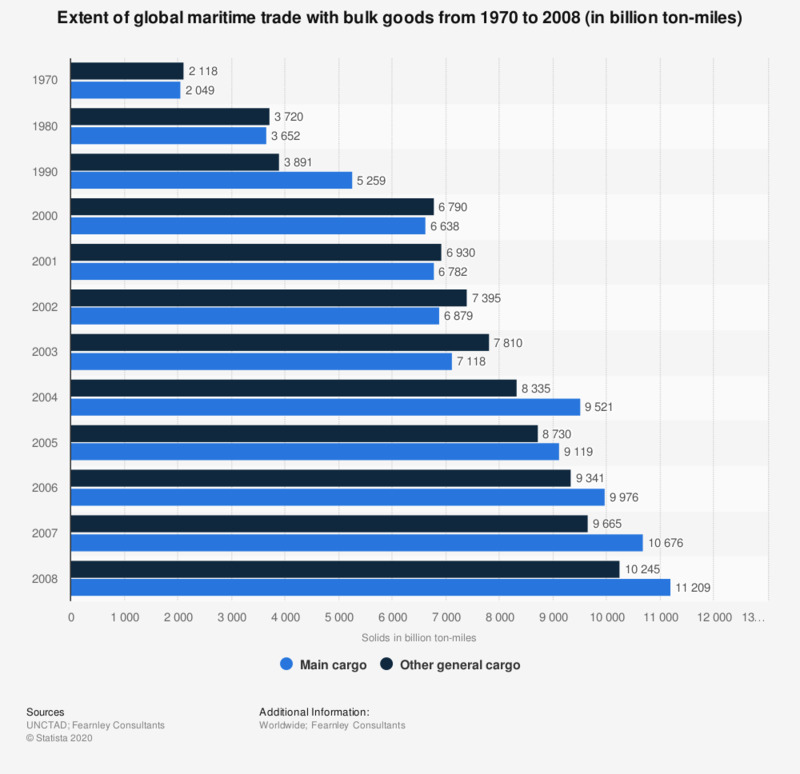 Martin Stopford – Maritime Economics, 3rd Edition, Chapters 6, 7, and 8. Shipping revenues are affected by the interplay between cargo capacity, productivity, and freight rates. Where revenue increases as each of these factors is maximized by the shipping company. The costs of operating a shipping fleet are determined by the interaction between operating costs – including periodic maintenance costs; the costs of maintaining the sea-worthiness of the ships in the fleet according to regulatory requirements and the shipping company’s own policies, voyage costs, and cargo handling costs. Lastly, ship owners have to worry about capital costs which are a function of the mechanism by which the fleet has been financed. Stopford points out that the shipping industry has not adopted an internationally accepted standard classification of costs, making any discussion about costs in the shipping industry confusing and unnecessarily difficult. To further ground our understanding of the economic realities of the ocean freight shipping market, the following data and diagrams from Stopford’s book are helpful. By comparing average earnings per day with the standard deviation of daily earnings, we get a sense of the extreme economic and financial uncertainty that plagues operators of shipping fleets. In the table below, notice that one way to guard against the revenue volatility that’s evident in the data above is for fleet operators to diversify the types of ships that they buy to compose a fleet. For example, one such fleet might be made up by combining VLCC, Panamax, Handymax, MPP 16kdwt, and Containerships in different proportions that add to 100%. Basically, the fleet operator has to invest in a diversified portfolio of ships in order to protect the fleet from the probability of failure or bankruptcy associated with any one specific ship or class of ships. The diagram below outlines the macroeconomic factors that influence supply and demand in the shipping market. Note that there are several factors over which the fleet operator has no control. The diagram below outlines the flow of cash and services between the 4 primary segments of the shipping market; The freight market, the shipbuilding market, the sale and purchase market, and the demolition market. “I used to cover shippers like Overseas Shipholding Group (OSG) back when I did distressed debt investing. These companies have pretty complex capital structures (For example; each ship is in a different entity). That required a thorough analysis of the assets and future earnings potential from those assets. In 2012 when I was covering this industry, we were really worried about low spot rates for everything from VLCCs to Panamaxes and also a deluge of fleet supply keeping prices low. She sent us this chart to illustrate the point about capacity. This is a double edged sword for startups selling into the market; on one hand shipping companies are highly motivated to find and pay for products that help them operate more efficiently. On the other hand, in the worst case scenario the ships might be scrapped in a desperate bid by some incumbents to avoid bankruptcy. This is not an uncommon occurrence since each ship is an independent entity onto itself, and can be allowed to fail without necessarily putting the holding company at risk. What Opportunities are Startups Pursuing? As we alluded to in our post on freight trucking startups, supply chain and logistics is a big market . . . and there are many startups building products to serve that market. This market map by CB Insights lays out the landscape in sufficient detail to provide a sense of the breath of the market for supply chain and logistics software. You can find the accompanying blog post here. CB Insights’ Supply Chain and Logistics Tech Market Map. Nov. 30, 2016. Given how far removed ocean freight shipping is from the day to day experience of most people, it should not be surprising that there is a much smaller number of startups building products for the ocean freight shipping market. Before we get to the startups, the following data and charts from CB Insights helps to paint of the level of interest among investors. Compiling data specifically focused on maritime startups would have been an incredibly tedious and time consuming process. So, we are using aggregate data as a proxy. The next three charts focus on startups pursuing marketplace business models, and reflect investments by institutional venture capitalists and angel investors only. Corporate VCs are excluded, for the most part . . . The database query might have failed to pick up a couple. The data is as of Jan. 30, 2017. As you can see, funding amounts peaked in 2015 while the number of discrete investments peaked in 2016. One way to interpret this is that, to some extent, the 2016 trend in number of deals may reflect a case of “me-too” investments driven by social-proof bias. Comparing measures of central tendency in the data, notice that there is dramatic jump in the average deal size in Q2 2015 and Q3 2015, but this trend is not reflected in the median deal size. The deals below largely account for the spike in aggregate funding amounts, and correspondingly, in average deal sizes for Q2 2015 and Q3 2015, respectively, in the chart above. The next chart gives you a sense of the investors who are most actively investing in startups that are building marketplace business models. The next three charts focus on startups pursuing business models in the Supply Chain and Logistics market, and reflect investments by institutional venture capitalists and angel investors only. Corporate VCs are excluded, for the most part – you’ll notice that the query missed a couple. The data is as of Jan. 30, 2017. Comparing measures of central tendency in the data, notice that there is dramatic jump in the average deal size in Q2 and Q4 of 2014, but this trend is not reflected in the corresponding median deal size in each period. The deals below largely account for the spike in aggregate funding amounts, and correspondingly, in average deal sizes for Q2 2014 and Q4 2014, respectively, in the charts above. The next chart gives you a sense of the investors who are most actively investing in startups that are building products for the supply chain and logistics market. Below is a sample of some of the startups building technology products specifically for the ocean freight shipping market. You may recognize some of them in the market map from CB Insights. There is no particular rationale for the order in which we have arranged them here. Descriptive summaries are either copied directly, or based on information, from each startup’s website. Other data presented below is based on information collated by CB Insights, Traxn, Crunchbase, or Mattermark – with CB Insights being the source that appeared to have the most complete information, where it was available at all, and that data is current as of Jan. 25, 2017. There are undoubtedly tech startups in this market that we have not yet heard about. Let us know about any we have omitted, but which you feel we should be aware of. Full disclosure, we have done some preliminary due diligence on a couple of the startups on this list. Summary: An online marketplace for international freight. Summary: A real-time price-benchmarking and market intelligence platform for international shipping. Summary: Developed, and markets, foldable shipping containers in order to reduce the cost of empty repositioning. Summary: Makes it easy to book and track container shipments. Summary: A licensed freight forwarder that uses people and software to manage the complexity of international trade. Summary: A web platform with which importers and exporters compare rates in real time and manage their maritime shipments quickly and easily from beginning to end. Summary: Connects commodity traders, food producers, and shippers to thousands of logistics providers through one platform. Summary: A digital ocean freight procurement platform built by freight forwarders, NVOCC’s and logistics service buyers. Summary: A modern, web-based Terminal Operating System (TOS) built for small to medium container terminals. Summary: Provides its customers with real-time visibility into the location of ocean freight as well as what’s happening at sea while the freight is in transit. Representative Investors: Horizons Ventures, Aleph. Summary: Optimizes global trade logistics through improved route management and increased situational awareness. Summary: A dynamic online marketplace connecting international shippers with NVOCC’s and Freight Forwarders. Summary: Puts ocean shipping in your hands. Get hassle free shipping rates and schedule your next shipment instantly. Summary: Sources and underwrites maritime loans, that are then offered to accredited and institutional investors. Summary: A market place for derivative contracts – forward contracts, for the container shipping market. Summary: Nautilus securely collects, reports on, and analyses raw sensor data generated on commercial ships. Summary: A multimodal transport optimization platform applying Industrial Internet of Things and Big Data Analytics to maritime operations. Summary: Predictive logistics software for operations in the container-shipping market. Summary: A multimodal transport optimization platform applying Industrial Internet of Things and Big Data Analytics to bring real-time visibility to cargo owners. Summary: Freight management software for freight-forwarding companies. Automates 99% of the freight management process, and automates freight quotes. Summary: Blockchain solutions for the shipping market. Summary: Software solutions and data products for the oil industry. Summary: First platform covering the entire dry-docking process, from first inspection to final report. Summary: A marketplace for chartering ships and finding cargo based on the user’s location. Summary: Software for the shipping industry. Summary: Paperless trade solutions to automate and accelerate trade operations and finance. Summary: A port or terminal operating system. Summary: An all in one software solution for reducing fuel consumption for merchant ships. Summary: Shipamax enables you to internally share fleet openings & the commercial status of each ship. Details can be accessed in real-time by the whole team, across multiple locations. Summary: PortXL is an accelerator program focusing on port related industries offering an ecosystem of founders, corporate partners, investors and mentors that support and accelerate the entrepreneurial journey. While we believe there is a smaller number of startups building products for the ocean freight market, we almost certainly have missed more than we have been able to capture. We are eager to hear about startups we have missed, or to hear about the ideas that people are exploring and hope to launch in the near future. Everyone loves containers. They see them. They get them. It makes sense. But when you look at number of vessels, container ships are only 10%. They’re inconsequential to bulk, crude, gas/chemical, and cargo. Much more interesting markets to be exploring in my personal opinion. On a relative basis, if software and automation are “eating the world” as it were, one might argue that the ocean freight shipping market failed to read the memo. However, it ought to be evident from the preceding discussion that there is a small band of entrepreneurs out to change that state of affairs. The report considers three scenarios and how each might be affected by demography, the global economy, demand for resources, and disruptive events. While the rest of the report is very interesting, for the purpose of this study we will highlight the events that the report’s authors believe could be disruptive to the shipping market in general, and hence to the ocean freight market. Russia joins NATO, and the balance of geopolitical power shifts quite dramatically. The United States Dollar loses its reserve currency status in a disorderly manner, causing upheavals in the global economy. There is a major pollution accident in the Artic, causing supply disruptions as well as significant changes to shipping routes. Geopolitical changes in the Middle East lead to conflict and constrain energy supplies. Unforeseen technological disruptions make formerly popular modes of marine freight shipping obsolete. A global economic and geopolitical collapse causes extreme disruptions to trade and commerce. Clean coal technologies, which have a significant impact of the amount of petroleum related products transported around the world by ocean tankers. Biofuels become sophisticated and efficient enough to have a significant impact on volume of hydrocarbon-based fuels that the world consumes, leading to a steep decrease in the export and import of petroleum related products. Robotics advances rapidly enough to change the manufacturing patterns for various types of consumer goods in ways that adversely affect international trade via containership since large volumes of consumer goods that were previously imported from China and other markets in Asia are now produced in fully automated factories in the markets that were the biggest importers of such good. The containership market suffers significant losses. 3D printing advances to the point where high end products and goods can be manufactured using this method. 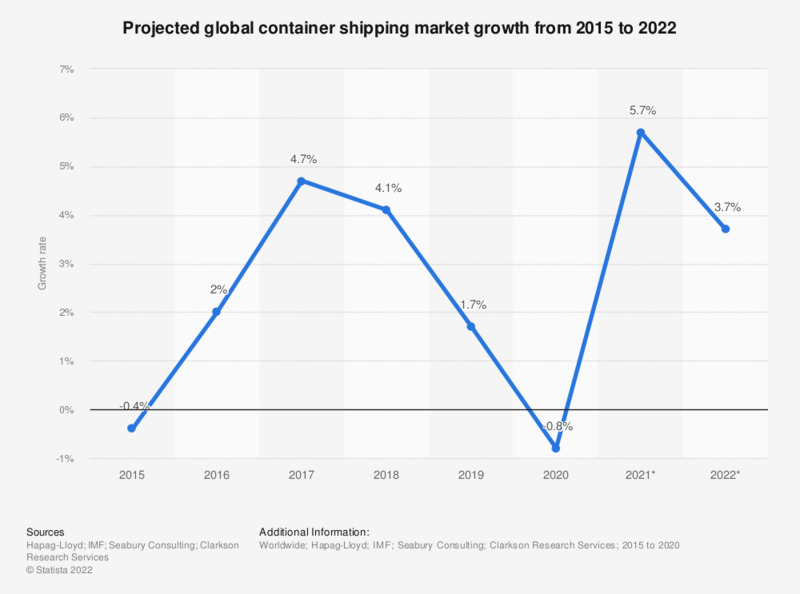 Together with the large-scale adoption of automation technologies in factories and the use of robots described above, marine trade by containership takes a big hit. Developing markets start a painful transition away from low-paying low-skill manufacturing jobs to high-skill jobs. Autonomous ships start to make an appearance in the commercial sector, after being tested for military use and gaining some adoption. Before we get to 2030, however . . . There are more immediate issues startups and investors operating in this market have to be aware off. Below we highlight some of them. Industry turmoil during times of frailty in the global economy can have a disproportionate impact on startups that sell to customers in this market because the customer base is highly sensitive to declines in international trade. Demand for the products and services that startups selling to this market will fluctuate with the business cycle. Industry consolidation is a concern. Also, consolidation within the industry during periods of declining trade may materially shift the balance of power within the industry in ways that could be disadvantageous to startups selling products and services for the shipping market. Price negotiations between shippers and carriers are confidential. This can be problematic if a startup’s revenue model is dependent on knowing this information. Piracy is an ongoing concern for the industry. Employees in the maritime freight industry in the United States are heavily unionized. Threats from tech sector incumbents are a real concern. Recent articles in MIT Technology Review, Bloomberg, and the Wall Street Journal discuss Amazon’s entry into supply chain management. It has established new sea and air cargo shipping operations, including registering Amazon China with the Federal Maritime Commission. That may be a possible first-step on the path to becoming a full-fledged freight forwarder as is explained in this blog post by Ryan Petersen at Flexport. The threat is such that journalists who follow that market feel that UPS and FedEx may also be under pressure if Amazon succeeds. Automatic Identification System (AIS) – A Key Technology? The overwhelming majority of maritime carrier vessels have their positions, speeds, and trajectories tracked by Automatic Identification Systems (AIS). AIS systems are usually composed of Very High Frequency (VHF) transmitters and receivers, GPS receivers, maritime electronic links, vessel sensors and display systems. AIS systems are ubiquitous because of Regulation 19 of the International Convention for the Safety of Life at Sea (SOLAS) Treaty. SOLAS was enacted in 1974 by the International Marine Organization (IMO), the United Nations special agency tasked with regulating shipping for its 172 Member and three Associate countries. The purpose of AIS is to provide safety at sea by increasing visibility and capacity to plan around surrounding vessels. The regulation applies to any ship with greater than 300 tonnes of gross tonnage registered in an IMO country. Traditional applications of AIS include collision avoidance, fleet monitoring, security, search and rescue, and cargo tracing. Should startups begin to experiment with ways to disrupt the maritime freight industry, AIS could prove to be a useful system on which they can build. Transparency is the first step toward building a highly predictable marine shipping infrastructure. Transparency into a ship’s location allows carriers and brokers to more accurately estimate the arrival of cargo. There is still a ways to go towards that end. In 2013, annual container lines schedule reliability, a measure of the percentage of ships that arrive within their delivery window, fell between 67% and 83%. Services that lend door-to-door transparency to cargo for shippers. AIS infrastructure can provide a foundation to future advances in cargo transparency and freight accessibility for shippers. A depiction of AIS – Source: Zinnos, Inc. Writing this post was primarily an exercise in learning more about the ocean freight shipping market in order to be better equipped for the conversations we are currently having, and conversations we may have in the future, with startups building products for this market. If we have missed anything you feel is important please let us know. We know how frustrated founders feel when early stage investors (a) do not know anything about a market in which they profess to wanting to make investments in, and (b) make no effort to learn enough about that market in order to have substantive discussions with the founders about what the founders hope to accomplish, and the merits of an investment in the specific startup that founder is building. We do not want to be that investor, we believe in doing our homework. If you are building a seed stage startup in this market we would love to hear from you. If there are early-stage startups we have not heard about yet, we would love to know that too. If you invest in or have invested in seed-stage startups pursuing any of the opportunities we have described above, or others in the ocean freight shipping market, we’d love to collaborate with you on future investments. If you are a shipping industry insider . . . We’d love to hear from you as well. One last thing. We’d like to express our thanks and appreciation to Britie Sullivan and her teammates at CB Insights for all their help obtaining data that we could not easily gather on our own for this article, and also for the freight trucking article before this. She answers our questions patiently, and often gives us more than we expect. This article is much better because of the data and insights she helped us obtain. Ninety Percent of Everything: Inside Shipping, the Invisible Industry That Puts Clothes on Your Back, Gas in Your Car, and Food on Your Plate. Update: February 8, 2017 at 19:47 to include comments from Sabeen Firozali, and to add footnote about IoT applications to engine Mx. Update: February 9, 2017 at 05:19 to include Nautilus Labs and MARSEC to list of startups, comment from Anthony DiMare, and link in footnotes to IoT in transportation and logistics article from Deloitte University Press. Update: February 9, 2017 at 11:16 to include AKUA and ClearMetal, also edit Nautilus Labs’ summary. Update: February 9, 2017 at 18:51 to correct Sabeen Firozali’s comment. It originally referred to interest rates instead of spot rates. Spot rates were higher in 03-10 and they are directly tied to revenue; higher spot rates lead to higher revenues. When spot rates were high, lots of companies invested in building ships. Update: February 9, 2017 at 19:31 to correct the aggregate funding amount raised by CoLoadX from $40,000 to $240,000 based on information provided by the co-founders. Update: June 20, 2017 at 17:22 to fix date typo in updates; change “2016” to “2017”.